Steep OPEC supply cuts, robust demand and geopolitical risk also factor into RBC's forecast. RBC's $75 call for international Brent crude is up from a previous 2019 forecast of $69.50 per barrel. The bank also boosted its outlook for U.S. West Texas Intermediate crude from $61.30 per barrel to $67 for 2019. "We see price risk asymmetrically skewed to the upside spurred by geopolitically infused rallies that could shoot prices toward or even beyond our high-end, bull-case scenario and test the $80/bbl mark for intermittent periods this summer," RBC strategists Michael Tran, Helima Croft and Christopher Louney said in a research note. The long-to-short ratio reached 13 times "at the peak of the oil price euphoria last fall" and averaged 8.5 times in 2018, RBC notes. 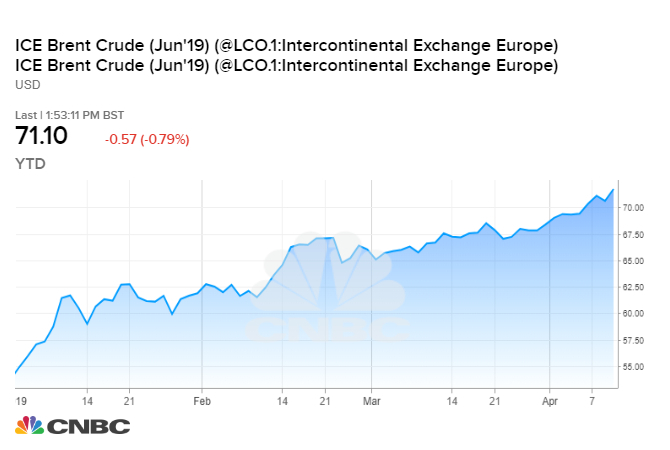 "In short, there is room to run to the upside given that geopolitical hotspots are still a clear and present danger for the market, but many wounded bulls remain following the Q4'18 washout," the analysts said, referring to the collapse in oil prices at the end of last year. "This is a surefire sign that the market is well balanced," the RBC analysts said. "In other words, rallying light, sweet Atlantic Basin crudes has little to do with headline noise, but much more to do with true refinery demand for the often-stranded marginal barrels." The global balance of supply and demand would have been looser if not for "the ferocious degree of Chinese buying." RBC estimates that China has stocked away 310,000 barrels per day since U.S. energy sanctions on Iran started in early November.